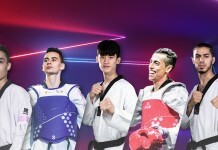 ROME, Italy (June 3, 2018) – Korea’s Dan-Hoon Lee hasn’t lost his appetite for World Taekwondo Grand Prix titles as he added a ninth in the men’s -68kg at the Foro Italico, Rome on June 1. However, it was not just his accomplishments in the ring that stood out. Equally as impressive was his refreshingly laid back, humble and fun-loving personality that shone through throughout the tournament. For many stars, the competitions attraction ends after the fight, but not for Lee, who stayed at the venue for pictures, handshakes and hugs with fans. It is his grounded demeanor that makes Lee, a three-time World Taekwondo Male Player of the Year, such a role model for the sport. “I know many people are supporting me and I like to repay them with good results and being friendly,” Lee said. Lee now has his sights firmly set on claiming an Olympic gold, a feat that he is still yet to achieve. However, he knows that there is a long list of Grand Prix’s to go before he has a chance to realize his dream at Tokyo 2020. His likability, popularity, raw talent and strong desire to win make him the firm fan favorite. If he continues his incredible Grand Prix winning streak and keeps adding to his already impressive Olympic points tally then he will undoubtedly be in with a great chance of realizing Olympic glory.